Can you believe it? It’s October 31st already?! Which means it’s Halloween and the end of Blogtober14! Shame really since I really enjoyed participating! 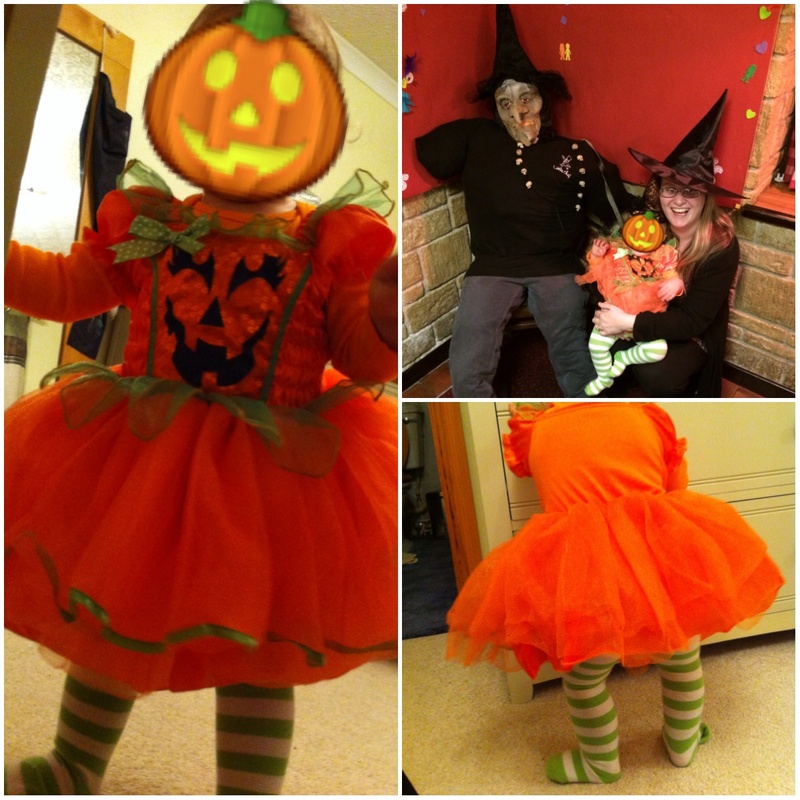 So for the last day of Blogtober14 the prompt is of course – Halloween Costume! I may have said this before but Halloween isn’t as big a deal in the UK as it is in the US. However I saw some gorgeous Halloween outfits for Little Miss in Asda and couldn’t resist! I bought the Pumpkin Tutu vest and at the last minute also decided to buy the Pumpkin dress. So I dressed her up in it and bought myself a witches hat… here’s the result! For privacy reasons I’m not showing her face.. but trust me, it was the cutest thing ever! And I just LOVE the stripey tights! We went out for food on wednesday evening rather than tonight since hubby’s out this evening anyway. Everyone said she looked like such a cutie pie in her outift! She certainly was! So that’s the end of Blogtober14! I hope you’ve enjoyed it! I can’t promise that I’ll be blogging everyday now but I will be blogging more often than I used to! Oh my goodness! It’s a good thing that you didn’t post her face because I would have just died with all the cuteness! Her costume was just so precious! I definitely respect your choice to keep your child’s face off the scary place that we call the internet. Too many sickos out there! She is just so precious! I bet you have your hands VERY full! Her costume was lovely! She looked so pretty in it! She is a little handful now! Lord knows what we’ll do when she starts walking!! Awww, she looks so pretty!!! Fab!